Almost everyone that submitted an answer was able to figure out that this is a Merlin. We had a total of 10 correct answers this week! 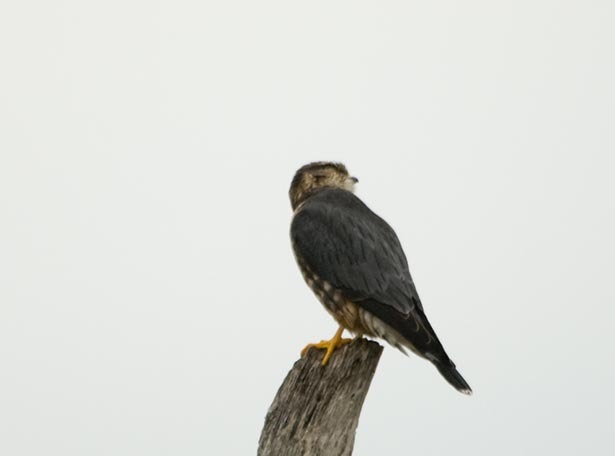 Everyone that responded this week was able to figure out that this one of the small falcon species, Ketrel or Merlin. The solid slaty gray back as well as the weak facial pattern and patterning on the belly lead us to identify this as a Merlin. Our final January Quiz can be found at http://nuttybirder.com/BirdQuiz/birdquiz.html#.UP9dcCdz6So.